What is the statute of limitations in Maryland for filing a car accident claim? I was crossing the street at the crosswalk at the intersection of Dundalk and Holabird in Dundalk near the new 7-Eleven, and I was hit by a car trying to take a right-hand turn. I have a comminuted fracture in my heel. I'm unable to work as a longshoreman, and I have a hard time paying my bills. Is there anything I can do to get immediate help? I don't want to settle my case early and not receive what I'm entitled to get but I'm struggling. Will my insurance rates go up after making an insurance claim in Maryland? I have a herniated disc in my lower back after a head-on car accident in Federal Hill in Baltimore. The other insurance company admits their driver is responsible. But the amount of money they are offering to settle my claim only puts $14,000 in my pocket. Why is the offer so low? Do I have PIP insurance? Who pays for the property damage to my car? I have comprehensive insurance coverage. Does this mean I'm fully protected? I got hit by a drunk driver who did not have car insurance. Is there a way I can still bring a claim? My car insurance lapsed and I was rear ended in Landover coming off Route 95 and broke my collarbone and fractured my ribs. Can I still bring a claim? In most cases, you are going to have three years from the date of the accident to bring a claim. The operative phrase is "most cases" because there are exceptions that can expand or contract that three year period. There are also notification requirements that require very technical compliance of intent to bring a claim in some cases that can be as short as 180 days. The take home message is that you want to talk to a lawyer soon rather than later to find out how long you have to bring a claim in your case. You are smart to avoid the temptation of seeking a quick settlement. You are going to get pennies on the dollar trying to settle a foot fracture case before your injuries have resolved. First, you need to talk to the at-fault driver's insurance company about PIP insurance. There may be upfront money you can receive from the driver's insurance company for your lost wages and medical expenses. If they have PIP, and the overwhelming majority of Maryland drivers do, the coverage will likely be between $2,500 and $20,000. Second, you need to make sure that you or your lawyer are getting the records as soon as humanly possible. When your case is ripe for settlement, you want to have the records and get the demand package out as soon as possible. Finally, completeness requires discussion of one other option. You likely have a quality case with a foot fracture. There are loan companies that will loan you money until your case settles. The problem is that the interest rate and fees on these loans are borderline criminals. It is the worst feeling in the world for us to get our client a quality settlement or verdict and see a significant portion of the money that the client deserves being tossed away in fees in interest. You should not give a recorded statement to the at-fault driver's insurance company without a lawyer. In most cases, you will not give a statement even with a lawyer absent in extenuating circumstances. The issue of whether to give a recorded statement to your insurance company is a more complicated one, especially in Maryland where you are arguably contractually obligated to give a statement under your insurance contract. We typically permit recorded statements with our clients by their auto insurer, in the presence of one of our lawyers. Your insurance rates will not go up in Maryland if you are not found at-fault for the crash, even if you make a claim. But your insurance rates will go up to an average of 22 percent if your negligence is found to have caused the accident. Insurance companies are not trying to give you fair compensation for your injuries. These companies want to collect as much as they can in insurance premiums and pay out as little money as possible on every claim. This "offer less than the value of the claim" tactic often works because victims - and their lawyers - lack the resolve to fight back. The vast majority of Maryland drivers have PIP insurance because you have to sign a valid waiver to forgo PIP coverage. PIP in Maryland is short for personal insurance protection. It covers medical expenses and lost wages after a car accident regardless of who is at fault. It is essentially free money if you have the coverage. PIP is money that you never need to pay back to the insurance company. The insurance company of the driver responsible for the accident will pay the property damage to the vehicle. 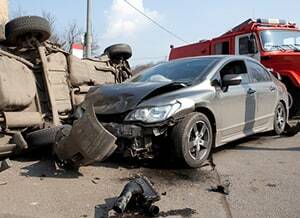 If another driver is responsible for the crash, that driver's insurance company should pay for the damage. Insurance companies lead you to believe that comprehensive coverage is "all-encompassing" when you take out a policy. But comprehensive insurance coverage is meaningless in personal injury auto accident cases. All comprehensive coverage does for you is provide more extensive property damage coverage. Maryland drivers are required to have uninsured motorist coverage. So if you have car insurance, you have uninsured motorist coverage. This means that if you suffer injuries as the result of the negligence of an uninsured driver, your insurance company agrees to pay you fair compensation for the harm and losses you have suffered. Under most Maryland car insurance policy, the amount of your uninsured motorist coverage mirrors the policy limits of your liability coverage. In other words, the insurance company's maximum obligation is to pay you the amount of the insurance limits you would have if you were the negligent driver. The battle then becomes what is fair compensation, and it pits you against your insurance company over how much money you should receive for your injuries. You do not need car insurance to bring a claim in Maryland. The focus of the inquiry for determining whether you have a claim is simply whether someone else negligently caused you injury. You can be driving on a suspended license, underage and the like and that does not prevent you from bringing a personal injury claim. We handle car, truck and motorcycle accidents in Maryland. If you or someone you love has been hurt or killed as the result of a careless driver, call us now at 800-553-8082 or get a free on-line consultation.